Wow, a whirlwind of poetry goings-on. A lovely reading at Politics and Prose with Barbara Goldberg--and then another with Sarah Browning at the Arts Club (which featured a luscious feast afterwards, including bacon-wrapped scallops). Both Sarah and Barbara gave wonderful performances of their work. Thanks so much to the DC literary community for coming out en masse...I read for 90 people total! It wasn't easy to put together set lists with so many loved ones in the audience--especially when you don't want to read the same poems twice in three days. Today I am hopscotching over to Madam Mayo's blog, to offer my take on five poets who have turned their considerable skills toward prose. Thanks to everyone who gave an encouraging nod toward my sestina draft (which was "born" at around midnight on Sunday, and took about four hours to evolve into the 4-AM Monday version you see below). This is part of a mini-project of sestinas I'm doing...nothing related to a book MS, just a workout of the formal muscles. I'll leave it up for the rest of the day before taking it down. -I don't like interrupting myself to go check the exact for order for the repetition of word endings. So I keep a "form" ABCDEF sestina in a Word Doc, and use that as a blank starting place for drafts. That said, I recommend NOT filling in the specific end words more than a stanza in advance of the actual drafted poem. If you do, you'll feel boxed-in and psyche yourself out. -Choose your end-words carefully, keeping an eye out for words that have homonyms or multiple meanings. This gives you more to play with. And if overall you're very fidelious to the form, consider making at least one bold substitution (i.e. "John" for "jaw"). Rules are meant to be bent, just not smashed into a million pieces. -On a related note: I don't think strict iambic is necessary, but I think it's a mistake to not aim for a regular line-length. Sestina writers who ignore meter create a situation where the the eye sees the end words as the ONLY reason for any given line break. The sestina ends up feeling like a runaway train, ready to veer off the tracks at any moment, rather than a gyroscope set in motion. With a ten-syllable line, enjambment becomes a much more powerful tool in counter-balancing the repetition. -Be strong of heart. The place where the repetition starts to beat the reader over the head is after the third stanza; it's also where you, as a poet, will grow tired of your subject. The same way that a sonnet has a volta (the six-line ending turn), this is where you want to create a narrative or tonal twist. Ask a question. Add a new element. -The best sestinas are written from a mindset that, to the reader, is palpably obsessive. Don't deny the reptition; embrace it. Write a poem of grief or anger or urging, where the form nourishes the tone. -Finally, trust the machinery. One of the funny things about sestinas is that beyond the first stanza they begin to dictate their own narrative path. This was originally an excuse to write about a piece of mythological trivia that has been nagging at me (it goes with Occam's razor)...but by stanza 3, the poem was all about John. The ostensible reason "why" I wrote the poem appears nowhere in this draft! Hope that's illuminating. What are your thoughts on sestinas? Who does them well? How have your own attempts gone, if any? 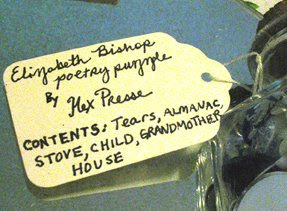 "Specimen Jar Poetry Puzzle inspired by Elizabeth Bishop" photo taken from Hex Presse, WOMB's chapbook publishing project. Thanks to everyone for their suggestions of journals-that-blog! I've already added a few to the blogroll, and will be doing some further investigation. My friend Barbara Goldberg introduced me to WorldCat yesterday. This site indexes the availability of books (or movies, cds, etc.) through libraries. I was thrilled to find Theories of Falling listed in 10 university libraries. Of course, my friend Kyle's book is listed in 188 libraries. So...I have some work to do. Still, I love this notion. I was a library addict growing up, frequently taxing the 50-book limit. When I sent out the email announcing ToF's publication, I specifically asked folks (especially those with academic affiliations) to request the title through their library. It is a REALLY important way of extending the lifespan of a book--that doesn't cost you a dime personally. This SUNDAY, I'll be reading with Barbara at Politics and Prose. P&P is a major independent bookstore, and Barbara is a wonderful poet--translator and author of many books, including most recently The Royal Baker's Daughter, which David St. John selected as the winner of the 2008 Felix Pollak Prize in Poetry. Please stop by if you can. I'm also reading this TUESDAY with Sarah Browning--author of Whiskey in the Garden of Eden and the mastermind behind the Split This Rock Poetry Festival. We'll be at the Arts Club, for a 6:30 reception and a 7 PM reading. Sarah is heading off to Italy for a year. Come by and show your love for all her hard work on behalf of the DC literary scene. P.S. 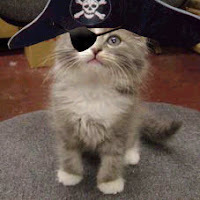 - Pirates! No reason. They're just on my mind. Holy heck...56 people turned out for last night's reading at the Arts Club. Go DC literary scene, go! That makes me doubly excited for the July 8 reading, featuring Ethelbert Miller and David Keplinger "Flirting with the Master" Pablo Neruda. In my mind, Neruda = summer. I'm happy to find out that Hayden's Ferry Review has launched a blog (in conjunction with their amzing Issue #42, "The Grotesque"). This has me thinking about other "journals that blog." Not blogs belonging to journal editors--though many of those are great--but rather, a community space where one can see the "voice" of the journal at work. They're intriguing, and I'd like to add a few to my blogroll. So: anyone have recommendations for good journals-that-blog out there? Ones that have substantive entries (not just PR) and are regularly updated? Pshares, the Ploughshares blog--there's a place to start. Next? Tuesday, June 17, 2008 - 7 p.m.
On Tuesday, June 17, the Arts Club of Washington will host acclaimed biographer Frances Kiernan as she shares stories from the life of philanthropist Brooke Astor, highlighting Astor’s ties to our nation’s capital city. Kiernan conducted extensive research and interviews for her book The Last Mrs. Astor, just released in a paperback edition by W. W. Norton. BROOKE ASTOR grabbed headlines when, at age 57, she inherited the Vincent Astor Foundation from her late husband and became one of America’s most prominent arts supporters. In 2006, the headlines turned dark as Astor became the victim of a battle over her estate and care. Upon her death in 2007, New York mourned the passing of its “First Lady.” Although known as a New Yorker, Astor spent much of her childhood in Washington, choosing to be married here; she was a regular visitor to the White House during the Johnson and Reagan administrations. So, my ballooning photos have been stymied by the realization that BOTH the film developing labs in my neighborhood have closed in the past year. Is this due to the rise of digital cameras? Argh. I'd like to be a luddite and stick with my "real" camera for as long as I can...but if that means bowing to the subpar service of RiteAid or CVS, I might change my mind. The times I've used CVS they've lost rolls of film, overexposed, or corrupted the surface of the negative. In cheerier news, Arthur Delaney--whose work I mentioned a few posts back--just won an award for his profiles of homeless people living in the DC area. Congrats Art! Am I the only one who walks to work each morning, passes coffeeshops after coffeeshop, looks in at the people on their laptops, reading the paper, drafting on notepads, and thinks...who ARE you people? What would I have to do in order to spend my days doing that? Surely they're not ALL students. Or Guggenheim fellows. Thanks to the editors for putting me in such a fine company of authors--these are all killer magazines. Really good writing, beautifully produced. I'm giddy. 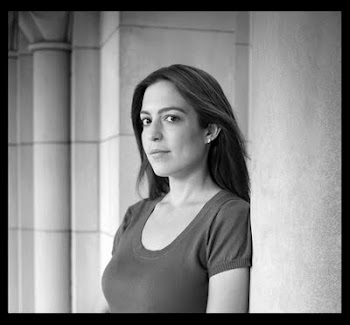 Update--and my poem "The Natives Are Restless," read by Steve Mueske, is now up at Linebreak! As a few of you know, I am tiptoe-ing into the world of prose writing. As such, I've been getting to know some DC writers who labor on "the other side" of things--freelancers, journalists, prose writers. So it's with borrowed pride that I congratulate Dave Jamieson, who just won the prestigious $10,000 Livingston Award for Young Journalists. Here's the announcement. Dave was an underdog--in a field that included writers from the Post, the Times, NPR, and the Wall Street Journal, he was nominated for a piece that appeared in the Washington City Paper, a free weekly. "Letters from an Arsonist" profiles Thomas Swatt, sent to prison for more than 25 years for hundreds of fires and two deaths. It's a gripping story that affected more than one generation of DC residents. This was no easy interview--Dave got the scoop by committing to an ongoing letter correspondence with Swatt. Looking at it through the poetry lens...when I see a list of 20-30 finalists for a book prize, I don't tend to see it in terms of communities making their mark. Poetry is a solitary art; it's fun to see a name I recognize or a title I've read in MS form, but that's about it. Yet looking at the roster of finalists here, I see whole papers/geographic voices being represented, and that's inspiring. It makes me want to know more about what's being published out there. Arthur Delaney, who has been covering the local news beat for some time (he's a Capitol Hill kid, homegrown), and has just started writing for Slate. You may have seen his piece on, ahem, whether a skull really CAN be used as a bong. Or, on a more serious note, this City Paper cover story about a guy who came to DC for a fresh start--and was dead five days later. Art's byline is gonna be all over the Post Metro section soon enough. I can tell. Holly Jones, who has been quietly filing "Dispatches from Anacostia" for McSweeney's since last year. For those outside the city, Anacostia is a bedraggled stepchild to Washington: on the eastern side of a rather dirty river, Anacostia struggles to keep the streets clean and the schools running, much less tap into downtown culture. But people have kids, and with kids comes hope, and with hope comes...dispatches. These postcards from the edge will get to you. 1. Who else will be at the Sewanee Conference this summer?